Mexico is a federal republic in North America. 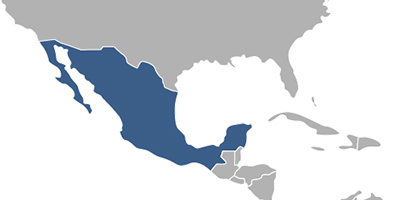 It is bordered on the north by the United States; on the south and west by the Pacific Ocean; on the south-east by Guatemala, Belize, and the Caribbean Sea; and on the east by the Gulf of Mexico. Covering almost two million square kilometres (over 760,000 sq mi), Mexico is the fifth largest country in the Americas by total area and the 13th largest independent nation in the world. With an estimated population of over 120 million, it is the eleventh most populous and the most populous Spanish-speaking country in the world and the second most populous country in Latin America. Fees associated with registration of IP rights in Mexico are available in the fee calculator.